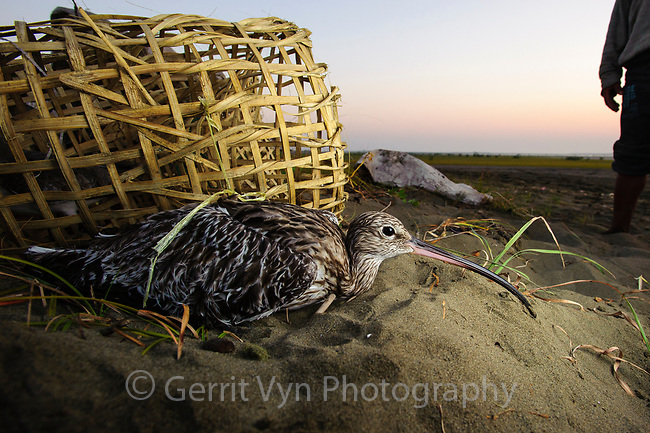 Shorebird hunter with Eurasian Curlew. This practice of hunting shorebirds is common throughout coastal Myanmar and Bangladesh where the majority of remaining Spoon-billed Sandpipers winter. As many as a hundred Spoon-billed Sandpipers were found this winter in Myanmar’s Bay of Martaban. BANCA, a Myanmar based NGO, is working to curb hunting in that region by providing alternative livelihoods. They have had success with some ethnic groups but not others. Rakhine State, Myanmar. January.